NEXTECH® DFS ForceTester is a more economical digital force tester but thus,provide a and are available for all testing requirements, withcapacities starting from 5 N to 2,500 N (0.5 to 250 Kg, 1.1 to 550lbs). 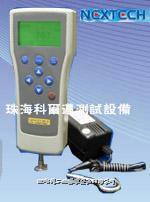 The DFS Force Tester are compact, easy to use and measureboth the load of tension and compression. Units of measurement canbe displayed with any units (lb, Kg, N) of measurement desired, bya buttons click. The DFS offers a far more functionality within itsprice range, with an accuracy of ±0.2%, and a lot of morefeatures.